I know I talk a lot about football this time of year - #sorrynotsorry! 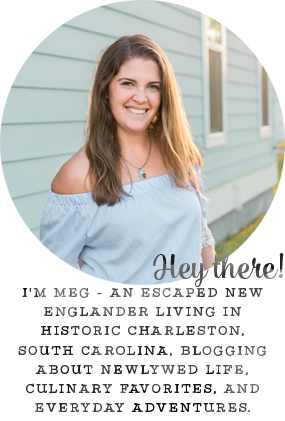 Since both Mike's college team and professional football teams are so far away (I've adopted our local pro team and could not love them more!! ), we obviously can only watch them on tv. 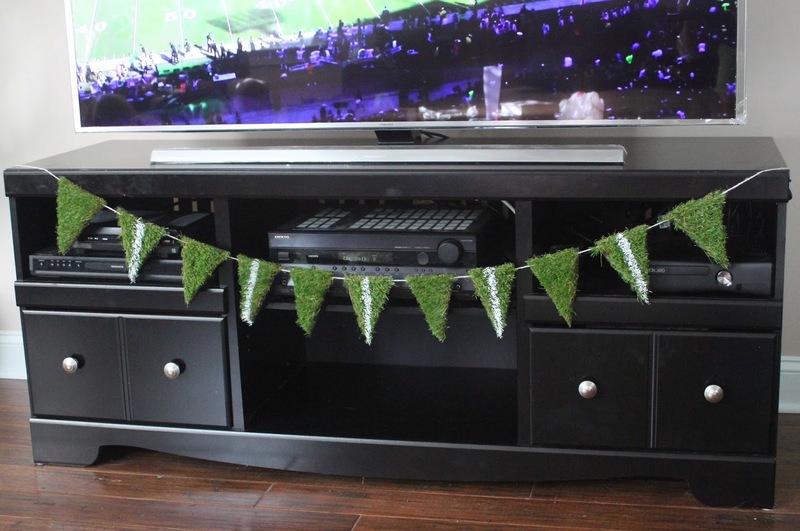 I thought it'd be fun to add a little football-themed home decor to our living room to really get us in the spirit each weekend. 1. Place the white paper over the synthetic grass and cut it so they are the same size. 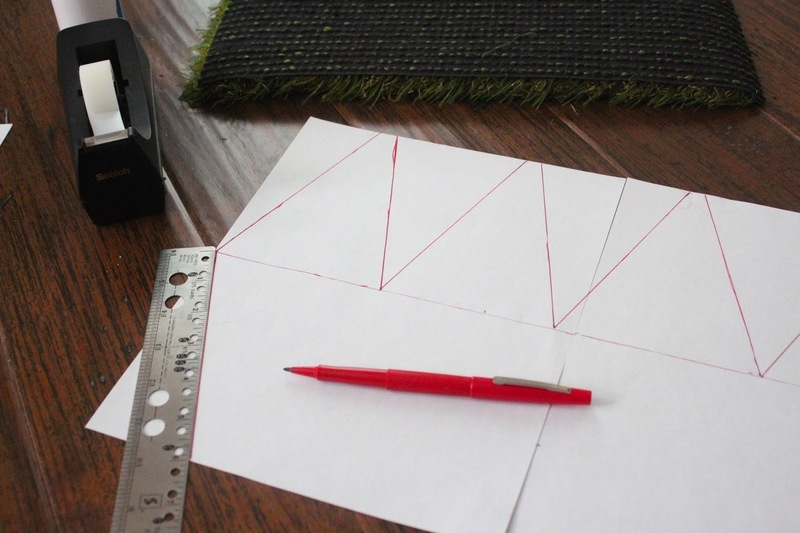 With the pen and ruler, draw out the triangles how you'd like them on the white paper. I can honestly say this is the first time I've used my high school math since, well, high school - pythagorean theorem FTW to determine my max number of triangles and dimensions - haha! 2. 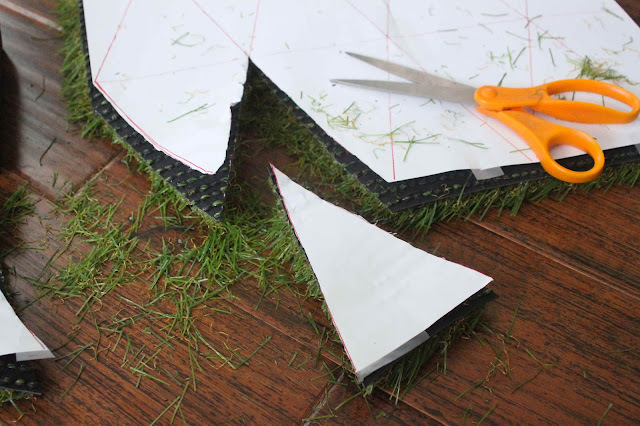 Tape the white paper to the back to the synthetic turf and use your scissors to cut them out. 3. 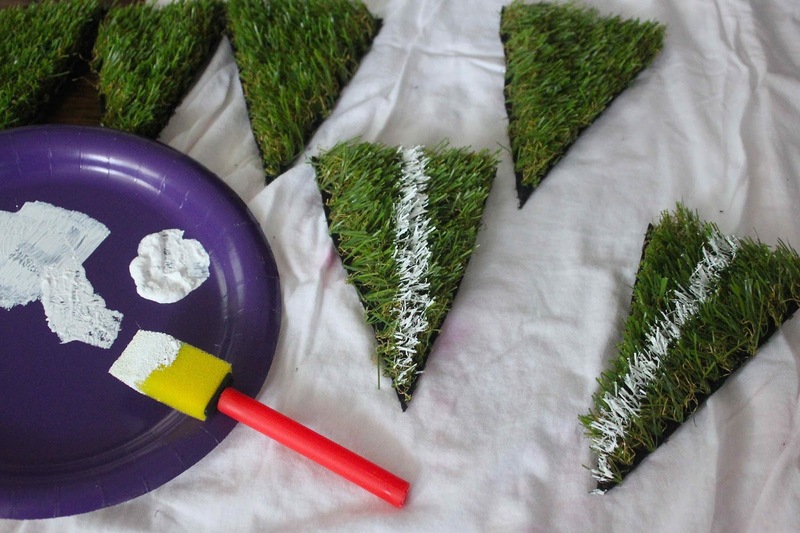 Paint white lines down the middle of half of your triangles to represent the yard lines. 4. Punch holes in the top two corners of each triangle and string the twine through each triangle. Now that the banner is made, it's time to sit back and watch our teams, but not before grabbing all of your favorite eats and drinks! CVS is the best one-stop shop for everything GAME DAY. 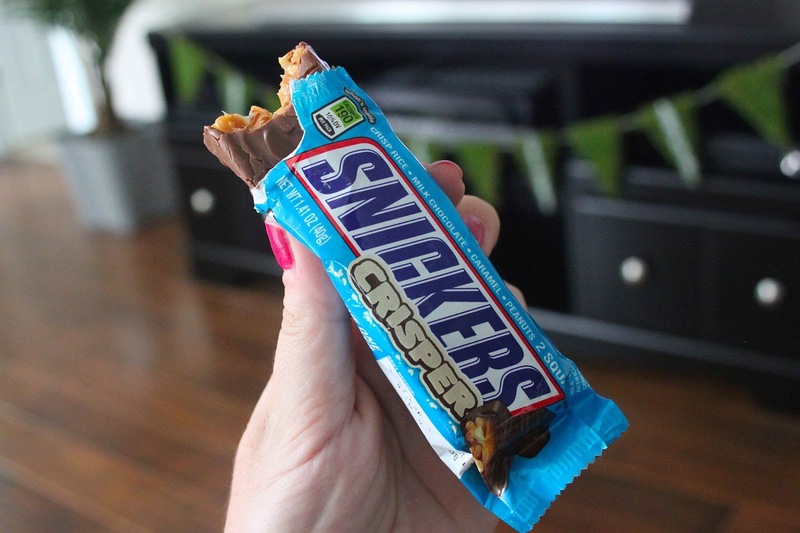 In addition to the chips and popcorn to snack on, I also picked up SNICKERS® Crisper bars. In select stores, you can also find special edition SNICKERS® bars with football packaging! Click here to download a coupon to save $1.00 on any two SNICKERS® singles or king-sized bars! My favorite way to enjoy SNICKERS® Crisper is snacking on pieces mixed in with some kettle corn - that sweet and salty combo gets me every time! Check out even more game day recipes and DIYs by clicking here! What's your favorite game day snack? what a cute DIY banner! perfect for the season :) and who doesn't love a sweet and salty snack! This is the CUTEST idea!! I love it!! You're so creative! Love the banner idea! Super cute! That banner would be awesome for super bowl - I may need to remember this! I bet that is the WORST MESS to make, but what worth it - super cute!!! That football banner is too cute for words & now I absolutely need to make one for our tailgate. Great idea! That banner is so adorable! I also love that it's football related without being in your face football or for a specific team! Ahh!! That is so stinkin' cute!!! Make sure to save that for Super Bowl too!! This is super awesome and really creative, I love it. I'd never thought to use actual turf before - cool idea! How cute! Love how simple this is and snickers are my fave! Love love love this banner! Gah I wish I had time to make this for tailgate in Clemson this weekend! 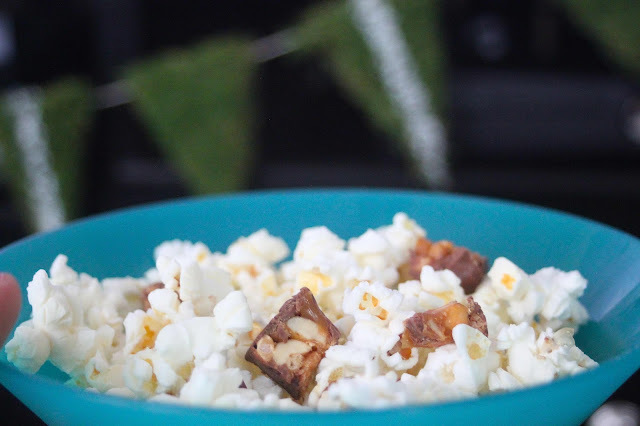 And yum... snickers and popcorn (we also love kettle chips mixed in our popcorn)! What a quick and fun DIY! I love this!! A grown up but fun way to enjoy game day!!! I'll be sharing this one!! Love the DIY banner. 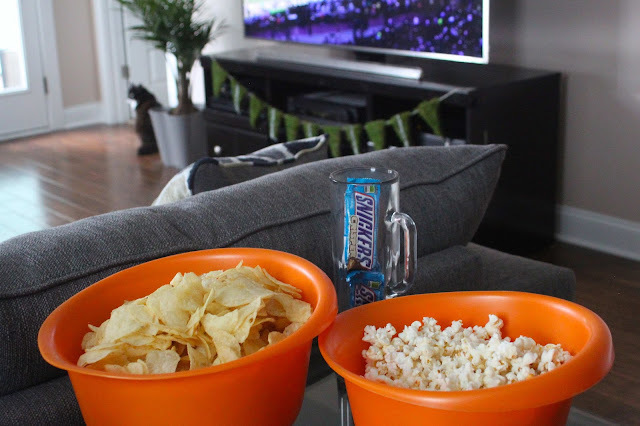 This would be so cute for football parties. This is such a cool idea! Now I'm secretly hoping to host a tailgate party just so I can try this! That is such a creative idea. It definitely gives it a more realistic football feel for sure. 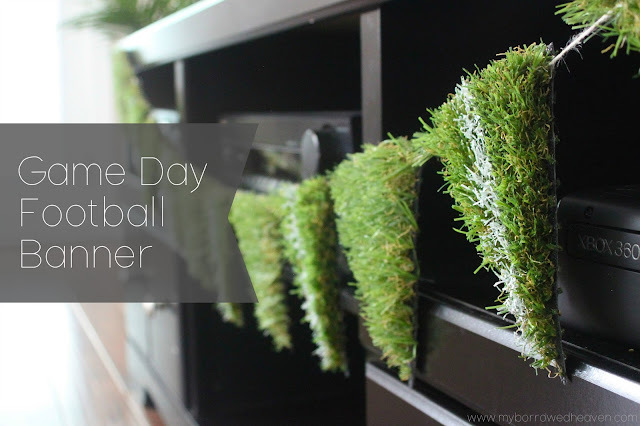 How much does synthetic grass go for? That banner is so cute! It looks so realistic using the turf.